Parents, please review the carpool instructions so that you understand how this system works. It is imperative that these instructions are followed as this ensures the safety of your children. Please do not pass vehicles in the carpool lane and please be courteous to one another in the lane. You will receive your carpool number when you come for your assessment with your student’s teacher. If you wish to drive west on Legacy Loop, please enter the east parking area and use the east driveway to turn left (north) onto Legacy Trail. At the stop sign (Legacy Trail & Legacy Loop) you may turn either left or right onto Legacy Loop. 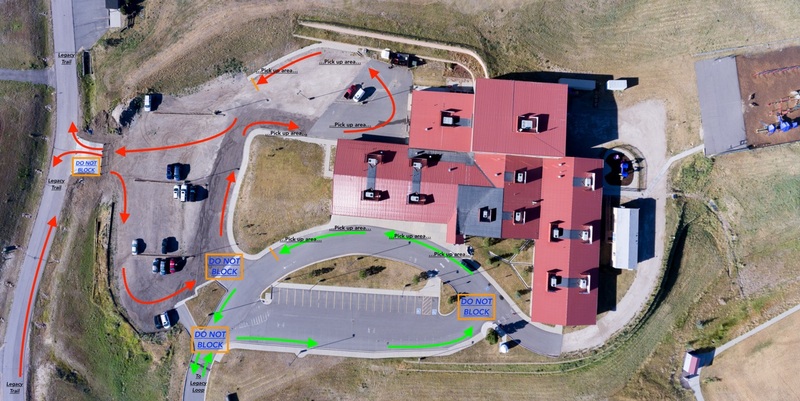 Turn right (north) into the gravel parking area and follow the parking area loop until it meets the sidewalk on the east end of the building. Please use the east driveway to turn left (north) onto Legacy Trail. At the stop sign (Legacy Trail & Legacy Loop) you may turn either left or right onto Legacy Loop.